How we plan to help you! We use a highly effective specific adjusting approach to help improve spinal biomechanics and reduce nervous system interference. The approach we use is based on a variety of factors with the knowledge that chiropractic science and technology is always improving. At Balanced Living Chiropractic Wellness, we know it is important to keep up with the latest advances in the science, art and philosophy of chiropractic and wellness. Dr. Kevin Phalen, DC, Dr. Steve Niemiec, DC, Dr. Katelyn Niemiec, DC & Dr. Justin Dritschel, DC teach spinal fitness and utilize new concepts in spinal biodynamics and spinal hygiene. The Balanced Spinal Specific Adjusting approach is a state-of-the art spinal analysis and spinal adjusting method for the entire spine with several safe and effective analytical and corrective procedures for each vertebra. It is a comprehensive, conservative, full-spine approach with an upper cervical focus. 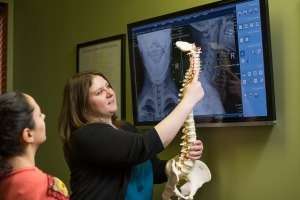 Our spinal analysis and care plan is both individualized and personalized. It incorporates both soft tissue tonal and specific segmental vertebral adjusting that includes static palpation, motion palpation and radiographic analysis, along with a precision drop table, instrument adjusting, gonstead, toggle-recoil and updated specific segmental diversified techniques that have been the foundation in spinal care. Call Balanced Living Chiropractic Wellness today! If you’ve been to a chiropractor before and have a preference about how you are adjusted, let us know. We want you to relax, enjoy and fully benefit from your adjustments. Call our Amherst chiropractic office today!